If you’d like the IRS’ official position regarding writing off your moving expenses from your taxes, read it here: Publication 521, Moving Expenses. Each individual has a unique tax situation, please do not use this article to replace actual tax advice from a certified professional. A deduction is a subtraction. In this blog post we will help explain how to subtract some of your tax liability at the end of the year when filing your taxes if you moved during the year. Layman’s Terms: The government won’t hold you “accountable” for the cost of moving. This means that they allow you to use the costs of your move and subtract them from your income for the year. This means that you save money by paying less taxes. Am I eligible for a moving expense deduction? There are two key phrases used here: Closely Related and Start of Work. Let’s dive deeper into what that means exactly. Timing: Did your move happen within one year of first reporting to work at a new location? Distance: Did you move closer to your new job? Meaning, your old home cannot be closer to your new job. Exceptions: If you don’t meet these requirements, please refer to the official documentation to read about exceptions. Depending on your job or situation, you may still be able to write off your moving expense even if you don’t satisfy this rule. What is the “Distance Test”? Layman’s Terms: If your new job is within 50 miles of your old job, you’re going to want to sit down and figure this out. It’s going to be close. If you new job is over 50 miles away, you’ll probably be fine, but double check with your accountant. 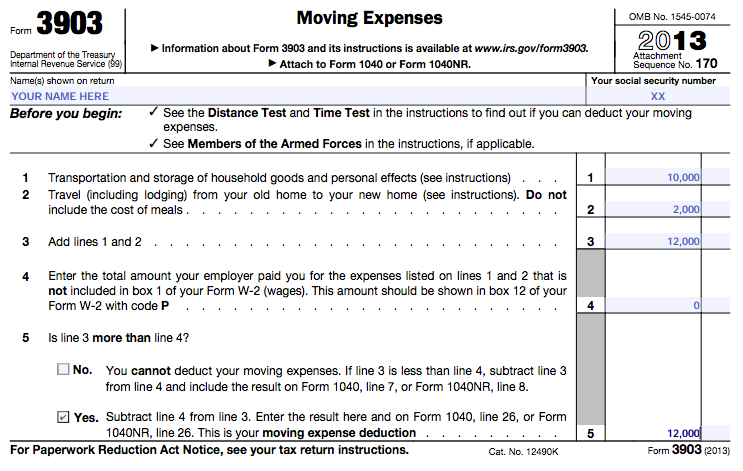 The IRS put together a worksheet to help figure out if you’ve moved far enough away here. What is the “Time Test”? If you are an employee, you must work full-time for at least 39 weeks for the first year. This comes out to 75% of the year. If you are self-employed, you must not only work full-time for at least 39 weeks for the first year, but you must also work for a total of 78 weeks during the first two years. Layman’s Terms: If you’re self-employed, you have to work for twice as long to fulfill the requirement. Congrats! You are eligible to deduct your moving expenses from your taxes! This means that you should keep track (and keep receipts) of all expenses related to your move. Keep track of how many miles you drove, hotel room costs, tolls paid, all of these items add up as you work to put together your tax deduction. Put together a list of all of these expenses—ideally with receipts—along with the cost for each line item. This list will help guide you with the next step. Exceptions: If your employer reimburses you for any moving expenses, you cannot deduct those expenses. Please refer to the official documentation to read about exceptions. In the example above, we are adding up both transportation/storage expenses plus travel expenses. In line 4, the IRS is asking how much your employer paid for your relocation. This number will be subtracted from your costs from line 1 and 2. If your costs exceed the amount reimbursed by your employer, you can deduct your moving expenses. You will enter this number on your Form 1040 (Line 26) or 1040NR (Line 26). Congrats, you’ve just learned how to deduct your moving expenses from your taxes! If you have any questions, we’d strongly recommend that you contact a certified tax professional.